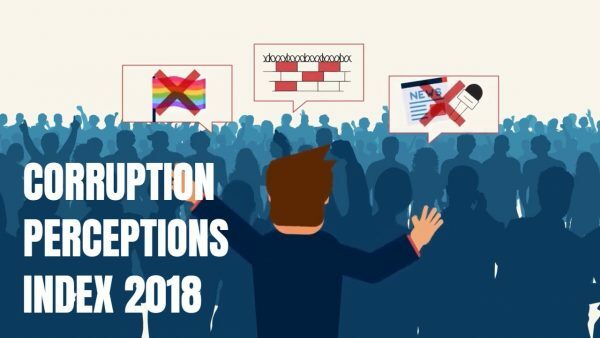 Transparency International, a non-partisan global movement that has a vision in which government, business, civil society and the daily lives of people are free of corruption, has recently released the most recent version of its annual Corruptions Perceptions Index for 2018. 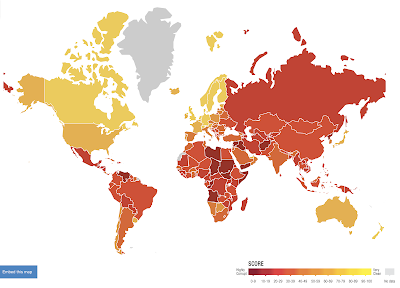 This index ranks 180 nations by the perceived level of public sector corruption according to experts and businesspeople that deal in each nation. Given that high levels of government corruption are often accompanied by a poor quality of life and threatened democracy, this measure is an important aspect of life around the world. The 2018 CPI draws on 13 surveys and expert assessments to measure public sector corruption with scores ranging from zero (highly corrupt) to 100 (very clean). In 2018, more than two-thirds of the 180 nations in the study scored below 50 with the average for all 180 nations being 43. Government corruption is something that you are highly unlikely to hear about from your elected representative no matter what nation you are from. 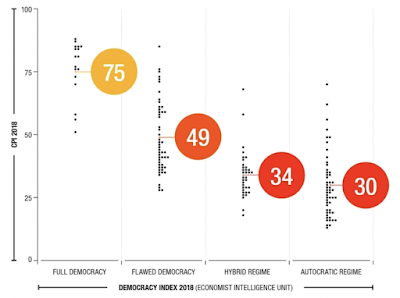 High levels of corruption slowly chips away at democracy to produce a reality where democratic institutions are completely undermined and citizens experience declining civil rights. I find it rather interesting that nations that have been subjected to America’s nation rebuilding and rebranding exercises (i.e. Libya, Iraq and Afghanistan) score among the lowest of all nations in the study, indicating that very little has been accomplished when military intervention is measured in terms of reduced government corruption. As we can see from this analysis by Transparency International, government corruption is a widespread problem outside of Europe and Canada. With the close relationship between high levels of government corruption and lack of democratic freedoms, many of us, particularly in the United States, should be concerned that our basic rights as members of what was once a relatively untarnished society are under threat. We need look no further than the Supreme Court’s 2010 Citizens United v. Federal Election Committee to see the source of at least one aspect of political corruption in the United States. Will Single Steven Tyler Turn To “groupies” Or Match.com?